The Mycro is deemed to be an impossibly bright and unbelievably small pocket light. Just how small is it? Small enough to be easily misplaced, being roughly the size of a thumb. Despite its diminutive form factor, the Mycro pocket light is still able to pack in up to a whopping 400 lumens of brilliant bright light when you switch to Turbo mode. Needless to say, when it is in Turbo mode, the battery will drain faster than normal, but if you were to turn off Turbo mode, it is still more than capable of providing an adequate degree of brightness in order to help you search for whatever you are looking for, without taking up much space. 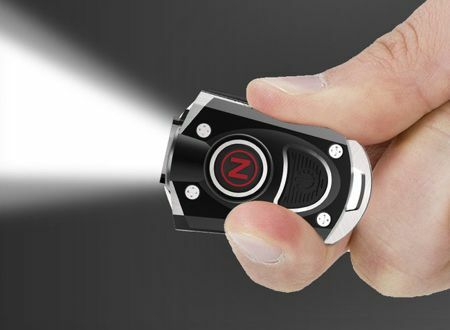 Touted to be an LED lighting technology breakthrough, NEBO claims that the Mycro pocket light is the smallest, most powerful flashlight available today. It is fully rechargeable (thankfully!) and boasts of half a dozen unique light modes. Two of these include low light color options (green and red). You can always opt to conceal in your hand, fit on a key ring or in a purse, thanks to the accompanying lanyard and a stainless steel necklace. The Mycro pocket light will retail for $29.95 a pop, arriving in Red, Black or Silver colors with an accompanying one year warranty.